Safwan Sobhan, additional managing director of Bashundhara Group, made the announcement during a courtesy call on the officials of the sports council Monday. 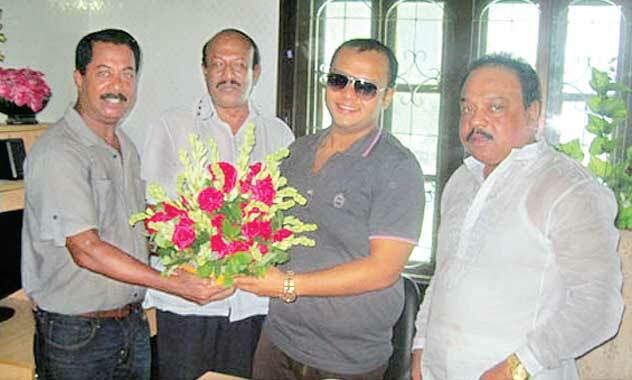 Manikganj Sports Council General Secretary Sultanul Azam Apple, Joint General Secretary Tayebur Rahman Tipu and Cricket Committee General Secretary Golam Sarwar Sanu welcomed Safwan Sobhan with a bouquet at their office at 11:00am. Afroza Begum, spouse of Bashundhara Group Chairman Ahmed Akbar Sobhan, Mahaboob Morshed Hasan, chief adviser to the chairman, and Dilara Mostafa, vice-chairman of Bangladesh Development Group, were present at the event. Later, Safwan Sobhan visited the stadium and gave assurance of building the remaining part of the roof of the west gallery. The roof of another portion was also constructed with the financial support of the business house. Safwan Sobhan talked about various matters of the council with its officials in a cordial environment. He donated Tk 50,000 to the council instantly on its becoming champion in Faridpur zone of the national cricket tournament. He also expressed eagerness to sponsor a cricket tournament in Manikganj. Later, Morshed Hasan told journalists that as Bashundhara Group always stands by the poor and the destitute, it also wants to be a partner in the development of sports. Sultanul Azam Apple thanked Bashundhara Group for its largesse. He hoped that Bashundhara Group will continue their cooperation and said the council will provide all-out cooperation if Bashundhara Group arranges any tournament in Manikganj.